Don’t run away at the words “gluten free” being in the title. I assure you that this isn’t a gluten free recipe that requires 3 different health food stores and a dictionary. As a self-taught cook and baker, when I see the words “gluten free” I scroll immediately to the ingredient list and see what weird things it requires, to see whether it’s worth me continuing reading or not. Weird food names often means I stop reading. It’s a sad day when you get your hopes up on an amazing recipe only to find out that you have to drive an hour away to find that magical ingredient. It’s a sad sad day. I try to avoid it at all costs. 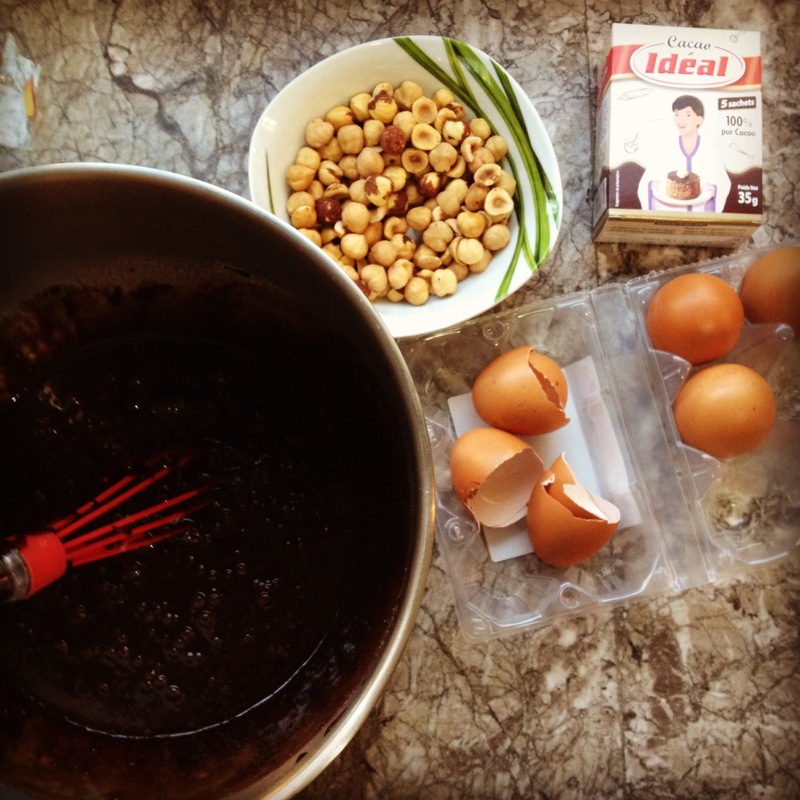 I stumbled upon this brownie recipe while searching for things to make with Chickpea flour. (Also known as Garbanzo bean flour, Gram flour and besan) My sister is gluten-intolerate and I love being able to make things she can eat that are “normal”. After playing around with a cookie recipe that used Chickpea flour I decided to branch out into brownies. These are just as easy as normal brownies, just swapping out the white flour for chickpea flour. Although every spice shop in my city here in Africa carries chickpea flour, it may be a little harder to find in the States. Check out the health food section of your local grocer, with the rise of Gluten Free diets, it’s sure to be there. The tiny grocery store in the town I grew up in now carries it, so I’m sure most major chains do now as well. These brownies are a perfect example of why I retreat to the kitchen at the end of the day. Brownies, with the taste of the ones we grew up with, that gluten-intolerate friends can eat. And that those of us that love gluten still enjoy. Being able to sit food down in front of someone that brings joy to their tastebuds and heart- its more of a gift to me than to them. I love seeing the smile on their face. My sisters especially. 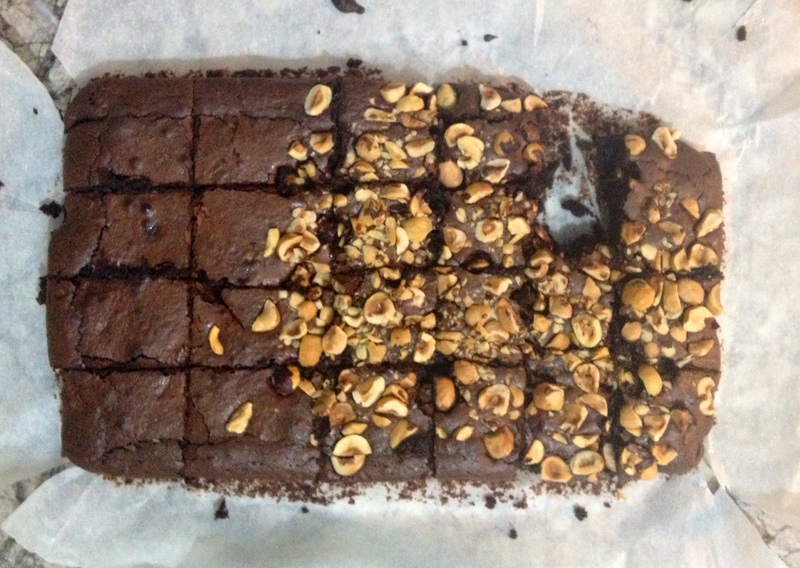 Make these brownies, bring a smile to someones face that hasn’t had real brownies in ages. Make their week 1,000 times happier. You won’t regret it. ** It should be noted that raw chickpea flour is not tasty at all. So for all of you batter tasters like myself, do yourself a favor and refrain. Trust me. Once the flour is cooked the raw bean taste goes away completely. 1. Melt butter and chocolate until chocolate is smooth. I used the microwave, but a double boiler works as well. Let cool. 2. In a separate bowl, beat eggs and sugar until pale yellow and fluffy. 3. If the chocolate mixture is still warm, add a couple of small spoonfuls of the chocolate mixture into the egg mixture to temper the eggs. We don’t want scrambled eggs in our brownies. No bueno. Slowly add the rest of the chocolate/butter mixture until well combined. 4. Sift salt, flour and cocoa together. I added around 1-2 tbspns of coffee grounds in this step to boost the chocolate flavor. Totally optional though. 5. Stir into chocolate/sugar mixture and stir until combined. Bake at 175 C/350 F for approximately 25 minutes, check with a toothpick to test done-ness. When it comes out mostly clean, they’re done. I won’t say that I didn’t sneak a bite before these were completely cooled, but if I happened to do so, i’d tell you that they are amazing slightly warm. AMAZING.